New Orleans is known for its exquisite cuisine, world-famous cocktails, and, of course, spirited Mardi Gras celebrations. More than one million spectators participate every year in search of the colorful costumes and an excuse to party – but that’s only a small portion of what the city has to offer during Mardi Gras. Look beyond the feather boas and tourist-filled Bourbon Street to discover that the locals have many other great ways to celebrate the carnival season. Here are some insider tips to help you experience a more authentic Mardi Gras in New Orleans like the locals do. Mardi Gras Day is Tuesday, March 5th, 2019, but Carnival Season begins two months earlier on Twelfth Night, January 6th. 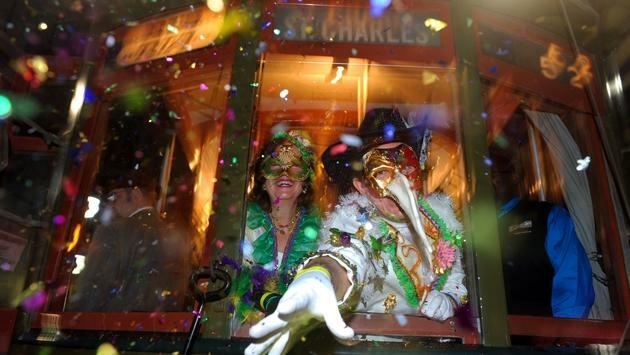 The most popular time to parade is the weekend before the Tuesday of Mardi Gras Day. For those who want smaller crowds, the weekend of February 22-24 is the perfect, fun-filled time to visit. Hotel accommodations fill quickly, so book early and let the good times roll in New Orleans! Popular krewes, social organizations that host parades, can draw hundreds of thousands of spectators. Locals claim their spot on the route hours before the parades begin rolling. Start your carnival days early to ensure a good view of the city’s beautiful festivities. You have the option to stake your spot on the street for free, but if you want to guarantee a great view, then reserve a spot in a grandstand or balcony before you go. You do not have to be a local to ride in a parade. Out of town visitors are also welcome to experience first-hand the excitement of riding in an Official Mardi Gras Parade! Select krewes welcome new members annually. If you really want to feel like a true New Orleanian, then put on your craziest outfit. Brightly colored wigs, tutus and sequins will ensure you fit in while standing out. Revelers who dress in costume often catch more beads and goodies thrown in parades. Make sure to embrace Mardi Gras colors too – anything purple, green or gold will do the trick. New Orleans & Company has your local scoop on all things Mardi Gras. Let us assist with securing hotel rooms and parade viewing packages for your clients. We can even connect your clients with local krewes, so they can truly embrace the spirit of the Mardi Gras and ride in a parade! We love the company. Come join the celebrations in New Orleans today! Thu has 14 years of experience working in the tourism industry. A native of New Orleans, Thu enjoys listening to live music, exploring New Orleans’ food scene and traveling with her family.